Well, it’s time to look at a new Bushiroad production. The others that I have reviewed have all been excellent for the most part with the occasional 7/10 which is still pretty solid. Unfortunately this is the first negative installment from the company. 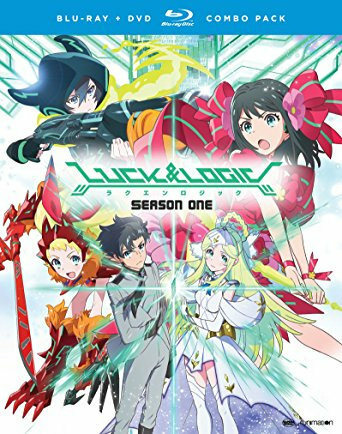 Luck & Logic falls into the unfortunate fanservice trap which is really what nails it. The low budget doesn’t help much either, but that’s the kind of thing that really just limits a show from getting a higher score as opposed to bringing it down. Still, not every show can be a winner I suppose. The show takes place in a future where monsters constantly invade the planet through rips in time and space that come from another world. Earth has monster hunters who merge with their partners to stop them. The issue is that there are only a handful of agents in every city and do the monsters always seem to have the edge. Still, there is currently a balance and the system works well enough. Tsurugi was a hero in Hong Kong, but he was forced to enter overdrive to stop the villain and this led to his partner being scattered forever and he barely survived. See, every person is made up of cards and the cost for using this super ability is that you lose all of your cards. If you friends don’t find them in time then you will permanently lose your self. One card is your memories while another is your emotions for example. Since there are dozens of cards to find and they are all pretty important, it is easy to never be the same after such an event. Tsurugi was lucky enough to stay intact though but he is transferred to a new unit where he will get a new partner. Will he fit in with the group and continue to protect the world from monsters? He sure hopes so! So on the surface this is another classic “Defend the world from monsters” story. It is fairly episodic as each monster is usually defeated in a single episode. There are some underlying plot elements that continue though and it all leads up to the final 3 episodes which is the big plot related fight. That sounds about right for a 12 episode show like this one. The early episodes are all about getting to know the characters. The pacing is solid and the show certainly doesn’t drag on as you can probably guess. There isn’t really anything all that unique about the show, but so long as the execution is on point you don’t need to do anything super special. Unfortunately the show’s main gimmick is what gets it into trouble. So, as I mentioned you have to merge with a partner to activate your super form which lets you fight the monsters. This form runs out of stamina almost immediately though so try to end the battle within a few minutes. Also you have to be completely in sync with your partner or the transformation will fall apart. The very iffy thing with the transformation though is that you have to kiss your partner or make a whole lot of contact in general, but basically every team goes with the first option. Naturally you can see how this would be a problem. It’s a pretty iffy excuse to just have the whole cast get in on the action and even conceptually it makes you wonder just how tough this is for the characters. Take Tsurugi and Athena. They know each other for a few hours and then they are suddenly made to be partners and have to undergo the transformation. It’s all rather drastic. Unfortunately the series doesn’t even make the transformations rather tame like Sailor Moon and they have quite a lot of fanservice. Seeing as how the transformations happen in every episode, you can see how this would drag the show down a bit. One of the final episodes is probably the most drastic as everybody transforms back to back in that episode so it’s whole minutes of everybody just transforming. This gimmick is ultimately what hurt the show the most as there just isn’t really getting around this. Both the fanservice and the concept of what you have to undergo in order to transform is pretty bad. Thanks to these scenes, the series had a real fanservice issue. Then we also had the typical anime character who is obsessed with bringing down the show. In this case the “old man” character was Tsurugi’s dad who is always messing around and trying to get his son to do the same thing. It’s one of those running gags where you have to wonder how people actually find it funny. It’s just grating and fortunately the guy doesn’t appear all that often which is a good thing. With the major issue out of the way now, lets look at the cast. Tsurugi is the main character here and he is known as the best agent in the world. He was able to overtranz (It’s pronounced like Tranz instead of Trance so that’s how I like to spell it) and live after all which isn’t something that just anybody can do. That being said, maybe anyone could do it as two other characters in the series do the same thing and survive, not to mention that Tsurugi also pulls it off a second time. Tsurugi can’t help it if he is the best and naturally he quickly becomes the leader of the group much to the sadness of the former commander. He’s a nice enough guy who gives pep talks and tries to keep morale high. Unfortunately, he doesn’t have much character beyond that and of course I still find it iffy that he had an original tranz partner that he never mentions or seems to care about at all. That person likely didn’t live through the experience or lost her memories but that’s why moving to a new tranz partner is so iffy. He also tends to overreact when Lucifer shows up but I guess he is a big deal. Athena is Tsurugi’s tranz partner and she seems like a nice enough character. She does hide her connection to Lucifer from the others but I think the heroes made a mountain out of a molehill on this one. It’s not like they were teaming up or anything. She is a very loyal partner to Tsurugi and since he was her first covenentor I don’t have the same problem with them tramping as I did with Tsurugi. Tamaki used to be the leader of the squad before Tsurugi stepped in and took her throne. She definitely doesn’t take this well and I can understand why she wouldn’t want to be taking orders from someone who came out of nowhere but that’s just how it goes sometimes. In real life that happens all the time as well. She does eventually get past this though and is an okay character. It’s just unfortunate that she looks weak. To an extent all of the characters look really weak, but Tamaki stands out in particular as she doesn’t have any real offensive abilities. She can heal herself and others which is really useful in most circumstances, but not in a 1 on 1 fight like she was forced into during the last 2 episodes. Still, she is good at tactics. Her partner Venus is the worst of the hero partners. To counterbalance how stoic and unmoving Tamaki is, Venus turned out to be a serious flirt. Surprisingly the show doesn’t focus on it much which is a good thing, but since that is her main personality you can see why she wouldn’t be one of my all time favorite characters or anything like that. Chloe is definitely the best member of the main characters as she is always ready for a fight. Unlike the other characters who are basically all yes men, she thinks about what is being told and decides whether to believe it or not. She is a detective part time as well and her fire form is one of the stronger abilities in the show. Chloe may not uncover all that much in her detective info gathering but the attempt is really what counts. Ultimately, Chloe has more personality than the rest of the cast and fortunately it is a good one. Valkyrie is Chloe’s partner but like the other monsters she doesn’t get a lot of personality. I guess she seems like an okay character, don’t expect her to get too many lines though. Olga is the big rival of the series and always talks with a lot of confidence throughout the series. You can barely believe your eyes while this is happening since he is the only agent to not have a partner yet. As a result, while he has the very powerful ability of reading the future, there just isn’t much that he can do about it. It was fun to see him admit that Tsurugi was smarter than he looked when the main character admitted that Olga was an incredibly skilled agent. Naturally as Olga was desperate for power this made it easy for Lucifer to begin his plan. I do think that the conclusion to Olga’s character arc was a little rushed though. He goes from being public enemy number 1 to being the leader of the group in the span of a few days? I don’t know, when people try to destroy the world you expect a different kind of reward than that. I don’t want to make the group sound too naive so I should mention that they have bombs floating around Olga’a head in case he ever tries anything. I guess that’s better than nothing. Lucifer is the big villain of the series but he was probably made to be a little too powerful the whole time. Without a Tranz partner he was already stronger than the whole hero group and then he got a partner and got even stronger. There was no way he could possibly have been defeated at the end and the fight should have been over in a snap. Granted, Olga wrecked his chances at the end and Lucifer should have just tried to end everything on his own. He certainly isn’t a very cool villain either as he loves his nightclub experiences too much and a subplot is that he has grown a bit of a cult. People get to tranz with him to have a bit of a thrill. I know that the heroes can’t do much about this since he would beat them up but it would have been nice to have seen them try to stop him, but they never made a single move. The monsters of the week were typically cooler characters even if they were basically just around to get stomped. At least they all showed up again at the end of the show…it wasn’t just to save budget. Asuha is the sniper of the group. She can turn invisible which is always a good tactic and her bullets pack a punch. She also has a more legitimate character arc than most of the other characters as she waits for her mother to show up every night. It breaks curfew but why should Super powered fighters have one anyway? It’s easy to see why Veronica lets it go since losing one of the few fighters that the heroes have just wouldn’t be tactically wise. Next to Tsurugi, Asuha is definitely the most useful member of the group. Her partner is Artemis. Artemis has a more important role than some of the other partners and can always be counted on to at least back Asuha up when the going gets tough. She can be a little abstract and random at tones but never becomes too annoying. Yukari is probably the worst member of the group by far. She can’t really fight at all and her partner is always making fun of her. She allows him to think that he is her master during the show and never really claims her dignity back from that. Even her costume is fairly half hearted. She is supposed to be the nicest character in the show but once again “nice” became synonymous with being weak which is unfortunate. So much for that eh? Maybe if she kept herself from crying in the last episode that would have at least shown some character development in her defense. Veronica is the field commander for the Logic troops. She may not be the highest ranked overall but is considered to be extremely powerful. She gets a lot of hype throughout the series but unfortunately never lives up to it. Like most of the cast she seems to just have one technique at her disposal. In this case it is her bombs and such a technique can only carry you so far in a fight. Fact of the matter is that she runs out of stamina about as quickly as everyone else and her bombs have no real effect on any of the really powerful opponents. Veronica is a reasonable leader nonetheless and is at least quick to jump into action compared to other leaders like her boss. The head of the organization doesn’t even seem to have a monster of his own at the ready. Nemesis is Veronica’s partner and always seems to be very powerful. We never actually see this but it is certainly very implied. Even though Nemesis is very old she still acts like a kid and enjoys having fun just like everyone else. That said, I wouldn’t be surprised if she has a darker side to her. Not that this show had time to delve into anything like that though. Shiori is Tsurugi’s sister but she doesn’t get to do a whole lot during the series. She does get Tsurugi to promise that he will always win in a fight though which he uses as motivation to get past any obstacle in his way. She is a big improvement over his father. Unfortunately the animation is a mixed bag. On one hand the actual visuals look really good. The character designs are sharp and the colors make it clear that this is a modern show. However, the show does seem to be rather low budget so when it comes time for the fight it suddenly dips in quality. We get a bunch of CGI and there is barely any real animation. The characters aren’t moving and instead seem to be frozen in place half the time. Most battles revolve around the monster shooting a blast and then Tsurugi blocks it. Don’t expect a lot of fast scenes or anything like that, the action scenes are basically turn based battles. It feels like a budget issue as opposed to a director choice, but you never know I guess. The soundtrack is rather generic and I don’t really remember it having any notable themes. Ah well, I guess there weren’t too many chances to play it even if there were a bunch of good themes since the fights never lasted too long. Overall, Luck & Logic definitely didn’t have enough luck to actually end up being a good series. It had some decent ideas, but having two characters merge was not a good one or at least not in the way that they pulled it off. They should have just fused DBZ style whether it be through the earrings or with the dance. Either way I could definitely buy into that and it would have solved a lot of the show’s problems. If you don’t mind the fanservice then this is a reasonable action anime to check out. At the same time, there are a bunch of shows that use the same concept but to better effect. The final episode does give you a glimpse at what the show could have been with a proper budget and better fight scenes as it feels a little like the climax of Buso Renkin or the beginnings of a Saint Seiya fight. Having the whole show be like that would have been hype. If you want to check out a better show in this genre, go watch Devil Survivor. That one has a lot of monsters and action but stays classy throughout. 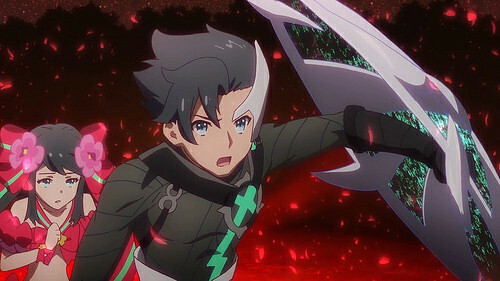 This entry was posted in 4 Star TV Shows, Reviews, TV Show Reviews, TV Shows and tagged Action, Anime, Anime Review, Bushiroad, Luck & Logic, Monster of the Week, Review, Sci-Fi, Transformation by dreager1. Bookmark the permalink. There seems to be quite a few shows out there that involve boys/girls merging to activate their special ability. I don’t blame the lead for having low stamina when merged. Happens to all of us when we get too excited.